My kids don’t love salad, but I don’t give up easily. Clearly you can teach them to “eat their salad” with less drama if you include their favorite ingredients only, instead of battling them to eat things they are at war against. Stick to what they like, and maybe try one new thing at a time. 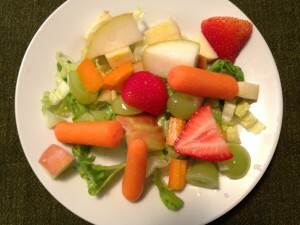 I make a virtually all fruit salad on a bed of romaine or iceberg lettuce and add baby carrots for the pickiest eaters. The more daring of the lot, can handle some orange or yellow peppers and celery as well. I always use the celery leaves mixed with the lettuce, and when I it on hand, I add fresh spinach leaves or a couple of basil leaves, as long as there are sweet fruits included there is a greater chance they will eat the other ingredients. 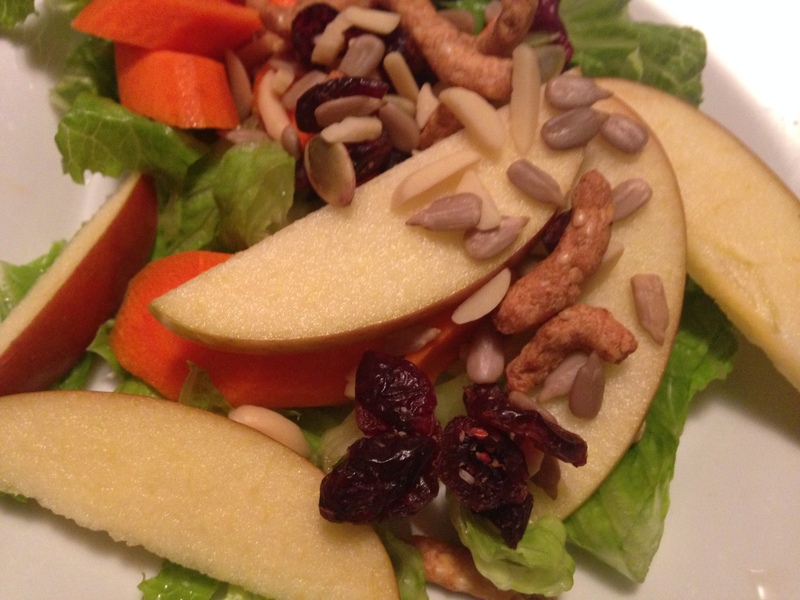 Some favorite fruits we add to our salads: Fuji apples and green grapes. Segments of Clementine oranges go well with Vidalia onion dressing. Strawberries just add such a pop of color! Lettuce tips: For Romaine lettuce you rinse it and then cut strips with a knife. For Iceberg break it apart in your hands, and for the bags that say they are triple washed, I still would rinse them anyway, who knows. I tend to avoid the bagged lettuce mixes and the pre-cut vegetables, it all seems very dried out and shriveled up to me. I would rather get it fresh and cut it myself! Sometimes I put walnuts or almonds on top, or I shave Parmesan cheese over the salads. Salad mixes available at the store are pretty good these days, our favorite has almonds and dried cranberries. A little crunch is good. Whatever works to start good habits, that’s my motto! Use Freshest Local Ingredients Possible! Take the kids to a local farmer’s market to pick local ingredients, or better yet, grow them yourself. It is October, and we are still pulling cherry tomatoes off of the plant in our backyard and building salads around them (as well as using them to make quick pasta/pizza sauces). Sometimes my kids like a little ranch or Italian dressing, but the store bought dressings are full of sugar (in whatever sinister form), and my homemade attempts generally fail. We usually stick to naked salad for the kids, maybe a squeeze of lemon. My Mom used to take ketchup and mayo (2 parts mayo to 1 part ketchup) and mix in some sliced green olives and stir – ta da! Russian dressing! 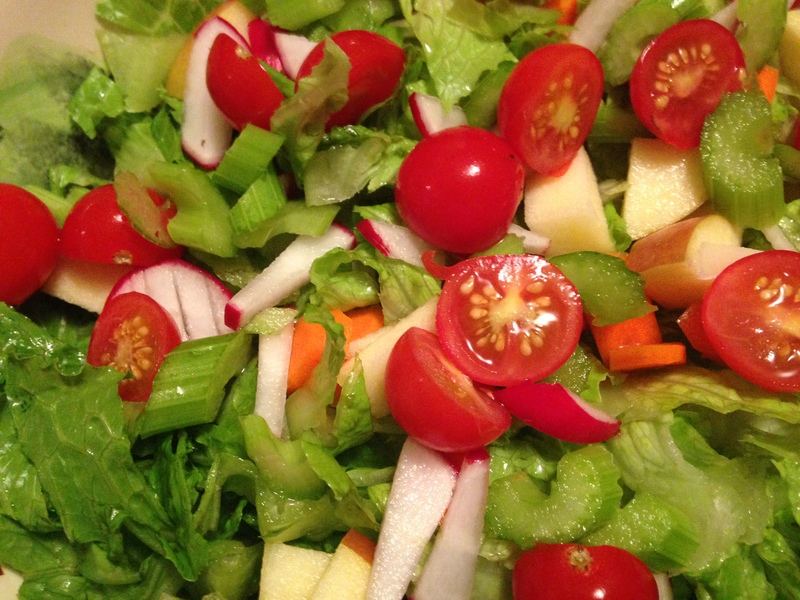 Please share – do you have a homemade dressing you love to make? That your family will eat? I tried shaking up lemon juice, olive oil, salt and pepper and it did not go over well!